Its my Friday lay day but today is going to be anything but. I am in Helsinki at present and it has been a busy few days so far. The concept of Unit Labour Costs (ULCs) is being used by the right-wing government in Finland to bash the population into submission so they can impose the nonsensical austerity. The Finnish government is trying to get rid of some public holidays and reducing wages for sick leave, overtime and working on Sundays. This is the starting point for a broader austerity attack on the public sector and the prosperity of the people. They are calling for a decline in ULCs of at least 5 per cent. The rationale is that with growth flat to negative for five years or so and the massive export surplus they had disappeared the only way to stop unemployment going through the roof is to cut labour costs relative to productivity – that is, cut ULCs. They have been caught up in the ‘dangerous obsession’ that prosperity can only be gained through ‘export competitiveness’ (whatever that actually is) and the domestic economy has to be sacrificed at the net exports altar. International competitiveness is a slippery concept at best but so-called internal devaluation is rarely a successful strategy. My visit to Finland has so far been interesting and I hope for my sponsors productive. There appears to be a growing resistance to the mindless austerity that the doctrinal government is seeking to inflict on the economy in the name of enhanced competitiveness. There have been some big public protests and there appears to be a committed group of younger activists who are gaining some headway in the public debate. I did some interviews on Wednesday afternoon when I arrived here with some of the leading newspapers. Finns seem to read a lot of newspapers (per capita) and they still subscribe to homedelivery in large proportions. The leading newspaper is the – Helsingin Sanomat – and it is the largest national daily in Finland and Nordic countries. Its reach in terms of the population makes it “a significant factor in Finnish society and in public opinion”. It is pro Eurozone. I am reliably told that its editorials are strongly neo-liberal in leaning but that its columnists have somewhat more freedom to develop pluralistic themes. It also has a very large WWW presence in Finland reaching around 30 per cent of the population. They published by interview with them (October 8, 2015) – Australialainen taloustutkija: Euroalue on joukkopsykoosissa. It was very cold when they took some photographs! I won’t translate the article word for word, but my Finnish friends were very happy with the content especially given the right-leaning editorial bias of the newspaper in general. Another interview was published by the daily business newspaper – Kauppalehti – which “is owned by the Business Information Group” of a major media company and is published out of Helsinki. It is a major information source for the Finnish business community. Its editorial position is “independent right” although that can be translated to be indistinguishable from ‘neo-liberal’. The article they published (October 8, 2015) – “Suomen ei kannattaisi olla eurossa – etenkään Saksan kanssa” – was sympathetic and the progressive movement here was really pleased to be getting this sort of coverage of the alternative viewpoint (to the neo-liberal TINA). The title translates broadly into “Finland should not be in the Eurozone – especially with Germany”. The third newspaper – Taloussanomat – appears in on-line form only and is owned by the same group that owns the Helsingin Sanomat. Readers in excess of 650,000 per week apparently visit the site. The article they published (October 8, 2015) was – Professori: Suomi, varo taantuman kulttia – which translates into “Professor: “Finland, beware of the recession cult”. I have been using the term Recession Cult to describe the elites in the Eurozone. This was also a sympathetic article. I did some another interview which have not yet been published. An almost immediate reaction to the publication of the article in the Helsingin Sanomat came from the right-wing political machine in Finland that is also embedded in the Brussels recession cult. The newspaper is very influential it seems and needs to know its place! How dare they give the Finnish population a glimpse of a world outside the Recession Cult that promotes the neo-liberal TINA! One character, Juho Romakkaniemi who is the Head of Cabinet for Jyrki Katainen, the current Vice-President of the European Commission under Jean-Claude Juncker, took to Facebook next morning to intimidate the newspaper for daring to publish the interview its journalist did with me on Wednesday afternoon. Romakkaniemi is in charge of “Strategy and overall management” of the “cabinet and communications strategy” among other official sounding things that mean ‘spin doctor’ and ‘head kicker’. He doesn’t sound as if he is a particularly nice chap. He has deep ties to the ruling Conservative Party, which is imposing increased austerity on its own people as the Finnish economy slides deeper into recession. The Party clearly doesn’t understand the most basic fundamentals of macroeconomics – Eurozone or not! Olisi ollut kiinnostavaa kuulla kenen kutsumana ja miksi tämä pienen jälkikeynesiläisen talouskultin tutkija oli Suomessa. Erikoisia ajatuksia hänellä ainakin oli: Isommat palkat eivät ole mikään ongelma yrityksille, vaan niiden etu. Ja valtio voisi vain työllistää kaikki työttömät niin työttömyyttä ei olisi. Joku sanoi sen täällä eilenkin, mutta onpa erikoisia nykyisin nämä Hesarin juttu-, näkökulma- ja haastatteluvalinnat. To make sure I understood the actual gist of his message I arranged for a Helsinki local to translate it for me. It would have been nice to know who and why this researcher from a small Post Keynesian economic cult was invited to Finland. At the very least, he has weird ideas: he thinks that higher wages are not a problem but a benefit for companies. Somebody said it here already yesterday but the choices that Helsingin Sanomat makes nowadays about its stories, viewpoints and interviewees are strange. Pressure from the top on the editorial independence of the free press! Groupthink in action. This is what totalitarian states aspire to – the ‘free’ press only being a mouthpiece for the entrenched elites. The government, consistent with what Paul Krugman called the “Dangerous Obsession” in a 1994 article ((Source), takes “it for granted that the economic problem facing any modern nation is essentially one of competing on world markets, that the United States and Japan are competitors in the same sense that Coca-Cola competes with Pepsi, and are unaware that anyone might seriously question that proposition”. This has been the IMF obsession. The EU obsession. But it fails a basic examination. … the world’s leading nations are to any important degree in economic competition with each other, or that any of their major economic problems can be attributed to failures to compete on world markets. The growing obsession in most advanced nations with international competitiveness should be seen, not as a well-founded concern, but as a view held in the face of overwhelming contrary evidence. First, the analogy between a private firm that can go bankrupt if it cannot sell enough to cover costs and a nation that cannot “go out of business” is clearly flawed. Mainstream economists tend to hold out the trade balance as a sign that a nation is competitive or not. This leads to the tendency to consider ever larger trade surpluses are positive and to be pursued. But giving away ever increasing quantities of real resources to foreigners in return for claims on their financial assets (which is what a growing trade surplus entails) is hardly a sign of strength if the domestic economy is compromised by low real wages growth relative to productivity, for example. Depressing domestic demand via austerity will reduce imports and eventually push net exports into surplus. Is that a desirable outcome? The question arises is that if you wanted to try to reduce ULCs how would you go about it? Well first we need to understand what variables are involved. Stocks (L) becomes a flow if it is multiplied by a flow variable like wage rate (W). So total wages cost per period is equal to W.L. Labour productivity (LP) is the units of real GDP per person employed or hour worked per period. That is, LP = GDP/L (if we stick to per person employed). This tells us what real output (GDP) each labour unit that is added to production produces on average. Unit labour costs are then (W.L)/GDP. So if the economy produces goods and services worth $1000 and total wages equal $200 over the same period then ULC would be 20 cents. Each unit of production costs the economy 20 cents of labour to produce. The term (W/P) is just the real wage or the real purchasing power of the nominal wage and GDP/L is labour productivity. So the relationship between movements in the real wage and labour productivity gives us knowledge of how RULCs are moving. I note that RULC is also equivalent to the wage share in the total national income. Please read my blog – Saturday Quiz – May 15, 2010 – answers and discussion – for more discussion on this point. So to reduce ULCs, we could cut wages (W) with everything else constant. We could reduce the labour input with everything else constant. If wages (W) were growing and we were able to increase labour productivity (that is, push GDP growth faster than employment growth) then ULCs would also fall. The problem is that internal devaluation methods focus on cutting wages (W) and assume that the other determinants will remain constaint. But we know from the extensive research literature that when firms attack the working conditions of their workers morale sags and productivity often drops. The ULCs may not fall at all and the nation is on the path in a race to the bottom. Further, there is a fallacy of composition operating at two levels. First, at the international level, if all nations are engaging in austerity and internal devaluation (which is the Eurozone mantra) then they just chase each other down the drain without any relative gains. This is especially significant given the importance of intra-Eurozone trade. Finland’s case is a bit different because its exports are heavily exposed to some non-Eurozone nations such as Sweden (the top export market) and Russia (third top). Germany is second top export market. Exports to Russia have slumped (it was previously the second largest market for Finnish exports) because of EU sanctions against Russia over Ukraine. That slump has nothing at all to do with competitiveness considerations. Further, Finland’s external position would improve if Germany stopped suppressing domestic demand in its economy. There is a strong income effect operating here which has nothing to do with price competitiveness. Should Germany stimulate its own economy somewhat (and it may have to if the VW saga starts to impact on real GDP growth there), then Finnish GDP growth would improve immediately with no change in its current domestic wages and productivity relationships. Please read my blog – Fiscal austerity – the newest fallacy of composition – for more discussion on this point. Second, there is an internal fallacy of composition operating to. A single firm in Finland might take the view that cutting its wage levels would not seriously impact on its sales volumes overall and would therefore increase its profitability. Whether that translates into higher employment and output or just higher profits is moot. Probably the latter. But if all firms in Finland hacked into wage levels (which is what internal devaluation is about) then there will be a serious negative impact on domestic demand. Wages are a cost (supply-side concept) and an income (demand-side concept). At the aggregate level the collapse in workers’ incomes as the government cut into wages would likely undermine domestic demand. Then the reduction in costs to firms would be swamped by the reduction in sales and prosperity suffers. Internal devaluation is really a casino game. The attack on workers’ incomes reduce domestic spending and introduces deflationary forces, not to mention the increase in unemployment. The population also faces a reduction in its capacity to meet its nominal debt obligations (such as mortgages) and has to reduce spending on other goods and services to ensure they have enough nominal income left over to meet these obligations. At the margin, some proportion of debtors do not have enough flexibility in their nominal budgets and they default, which causes further problems in the domestic economy. The casino aspect of the strategy is that the government is really trading off the rate at which the domestic economy contracts against the rate at which exports might grow as a result of the domestic deflation in costs. Empirical evidence suggests that for most countries the pace of contraction in the domestic economy is greater than any positive growth in exports. In the Eurozone, it looks like only Spain has defied that usual trend over the last few years. Further, internal devaluation is relatively indiscriminate in its impact, attacking the wages and conditions of workers in the traded-goods and non-traded goods sector alike. So the question arises: How does the attack on the wages of teachers, hospital workers, welfare officers, bus drivers etc who all work in the non-traded goods sector feed through to stimulate export competitiveness? The links would appear to be rather circuitous if at all. Such wage cuts would appear to be more about redistributing national income to business profits generally rather than directly stimulating firms that compete in the exports sector. There is a strong body of evidence that suggests that the growth in a nation’s living standards is driven by domestic productivity growth rather than how its exports compete in international markets. Consider the following graph, which shows the movements in monthly – Effective exchange rate indices – (REER) as produced by the Bank of International Settlements (BIS). You can learn about this data from their publication – The new BIS effective exchange rate indices – which appeared in the BIS Quarterly Review, March 2006. There was an earlier publication – Measuring international price and cost competitiveness – which appeared in the BIS Economic Papers, No 39, November 1993. Real effective exchange rates provide a measure on international competitiveness and are based on information pertaining movements in relative prices and costs, expressed in a common currency. Economists started computing effective exchange rates after the Bretton Woods system collapsed in the early 1970s because that ended the “simple bilateral dollar rate” (Source). The BIS ‘real effective exchange rate indices’ (REER) adjust nominal exchange rates with other data on domestic inflation and production costs. If the REER rises (falls) then we conclude that the nation is less (more) internationally competitive. 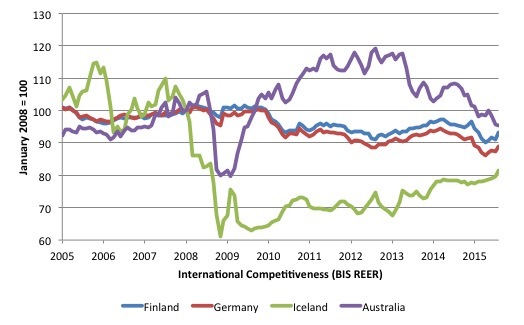 The graph shows the movement in real effective exchange rates from 2005 to August 2015 for Germany (red), Australia (purple), Iceland (green) and Finland (blue). I included Australia and Finland because they are two small, open economies which float their exchange rate, as distinct from Finland and Germany which do not float as a result of surrendering their currency sovereignty. Australia is interesting. It experienced major declines in international competitiveness, as the boom in terms of trade pushed the exchange rate up after a temporary lull during the GFC. As the commodity prices boom has tapered the Australian dollar is falling swiftly and competitiveness is rising again. However, the fluctuations in standards of living in Australia are not particularly driven by these movements. Please read my blog – Eurozone unemployment – little to do with international competitiveness – for more discussion on this point. But Iceland is the interesting case. It had a huge collapse in 2008-09. But its government did not engage in widespread internal devaluation. Instead, the exchange rate fell sharply which gave the nation instance gains in international competitiveness. Once the crisis subsided, you can see that the exchange rate increase has seen the REER for Iceland rise again somewhat. The point is that gains to international competitiveness (if that matters) are much better achieved by allowing the exchange rate to move in response to external imbalances that the markets want to redress than attacking the local wages and conditions. First, depreciation impacts on all import prices. The nation as a whole has to take a real income loss and then the question is how is that shared. Notwithstanding the fact that exports then become more attractive to foreigners, the depreciation also gives domestic residents and firms an incentive to substitute away from those goods where possible. So when the AUD is weaker, we travel less overseas and take holidays within Australia. This boosts domestic demand and sustains employment. Firms have an incentive to alter production or engage in new product innovations. I have noted before that Greece, for example, exports its world class olives to Germany and Italy for processing into olive oil. If their exchange rate depreciated somewhat, then it would provide incentives to local processors to start up and investment would be attractive in that sector. Second, depreciation does not alter nominal incomes within the domestic economy, whereas internal devaluation does. This is quite a significant difference. Most liabilities are specified in nominal terms (for example, mortgages). If real income levels are being reduced, people who hold nominal liabilities have to reduce expenditure on some items to ensure their nominal incomes can meet their liabilities. Depreciation of the currency in international markets provides scope for domestic residents to make those sorts of shifts in spending. But internal devaluation directly reduces nominal incomes and makes it much harder to rearrange household spending patterns to ensure all nominal liabilities can be serviced. It is therefore a much more damaging path to improving competitiveness. Finally, it is clear that increasing productivity will also reduce ULCs. The Finnish government is facing an on-going recession which needs more spending to redress. Private spending (particularly capital formation) is weak. Internal devaluation will suppress domestic consumption growth even further. The only viable remedy is for the public sector to expand net spending (its deficit). It could increase public investment expenditure, stimulate the research and development sector, improve conditions within its education system (which are undergoing sharp cuts) – all of which would stimulate productivity growth and improve prosperity. The problem is that it is so caught up in the weird neo-liberal Groupthink that it cannot see past its own blindness. Please read my blog – Finland – more austerity is not the answer – for more discussion on this point. Finland has always been a major producer of pulp and paper given its massive forest resources. The forestry industry overall delivers about 15 per cent of Finland’s total exports. But in recent years the output and exports from those industries have been falling. Has that been due to competitiveness issues? The decline is more related to structural shifts in end products that rely on paper as input. The acceleration in the shift away from paper products has been due to “Europe’s recession”. What about the failure of Nokia, which is brought out in almost every conversation over here as an example of how uncompetitive Finland has become because of its pay conditions and public holidays. The reality is that we can trace a lineage of massive corporate failures of companies that were the first-movers and then lost it. Think about Sony Walkman -> Kodak -> Nokia -> Blackberry – which are all similar stories and unrelated to changes in cost competitiveness. The companies in question failed to anticipate the shifts in consumer sentiment. Nokia was characterised by ‘too many candy bars’ (referring to the shape of their very popular phone handsets) and failed to see that the big market shifts were in favour, first, of flip-top handsets and then the software innovations (touch screen etc) that Apple brought to the market. They could have cut their wages to the bone and still would have lost their mojo. Nokia did not lose market share because wage rises undermined its ability to compete. This article (September 4, 2013) – How bad calls led to Nokia’s demise – is a reasonable depiction of what happened. I have read a lot of articles about the demise of Nokia in recent years. This one is representative of what might be considered a consensus view. As you will note the demise had little to do with wages. 1. “the Finnish phone giant grew dangerously intoxicated on its own success during the late 1990s and early 2000s. Having ridden so high for so long, it is perhaps no surprise that a degree of complacency and arrogance crept in just as had happened at Kodak and Motorola”. 4. “a third causal factor in Nokia’s demise was its stifling levels of bureaucracy” – which saw its management fall behind “the curve”. In particular, it refused to introduce “color touch screens, mapping software and e-commerce functionality” and ignored its technical engineers who had “designed a wireless-enabled tablet computer long before the iPad was even imagined”. Its research department was “disconnected from the company’s operations departments who were responsible for bringing devices to market”. 5. “Nokia’s example is a case in point of how critical it is to anticipate shifts in the marketplace and adapt before your hand is forced”. That sounds like a management failure to me – rather than greedy trade unions undermining the competitiveness of an able company. Various case studies I have read about the demise of Nokia and other large companies reinforce the idea that the management becomes trapped in their own Groupthink which patterns their behaviour and insulates them from reality. They become their own legends. Here is the FDOM’s take on the TPP. 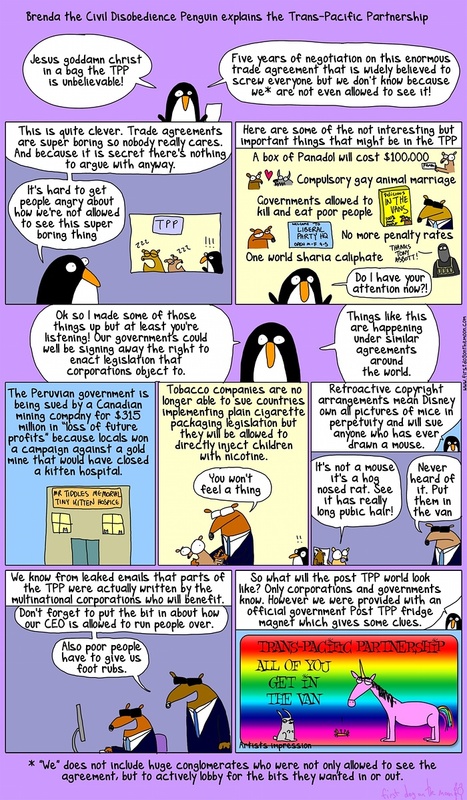 The cartoon is available – HERE. This is what I am listening to this morning as I work. Outside (I am in Helsinki) it is currently -4 degrees and was a little colder an hour ago when I was out running in the streets. So to warm up my numb brain I put Tommy McCook on the sound system (my iPhone!) and away we went. This is one of my favourite albums – Reggae in Jazz – which came out on vinyl in 1976. My old record was a bit worn out and I was pleased when it was finally re-issued on CD in 2013. It features – Tommy McCook – on tenor saxophone. He was an original member of the Skatalites and moved on to head up the Supersonics. While he spent most of his life in Jamaica he was actually born in Cuba. His tenor playing was heavily influenced by an early encounter with John Coltrane’s playing and that bebop and hardbop style was then insinuated over the Jamaican back beat and what a sound it was that emerged. The entire horn section on this album was the best Jamaica had to offer – Bobby Ellis, Herman Marquis, Roland Alphonso, Tommy McCook, Vin Gordon. World class. On bass is Aston “Family Man” Barrett, George Fulwood, Robbie Shakespeare. On drums – Carlton “Santa” Davis, Carlton Barrett, Michael Richards, Sly Dunbar. Guitars are played by Bertram “Ranchie” McLean, Dwight Pinkney, Earl “Chinna” Smith. Keyboards – Ansel Collins, Jackie Mittoo. It gets one warm just listening to it. You say “International competitiveness is a slippery concept at best but so-called internal devaluation is rarely a successful strategy.” I suggest, in contrast, that internal devaluation does actually work and wouldn’t be a bad idea if it can be implemented quickly and painlessly. But the monster problem is that it takes years, if not a decade or more of agony to implement. If internal devaluation didn’t have much effect, it would follow that “internal revaluation” (and consequent loss of competitiveness) wouldn’t do much harm. In fact I suggest that unwarrented revaluations actually do do harm. That’s exactly what Greece did in the first decade it was in the EZ: Greeks increased their pay by around 50% in terms of Euros, as compared to Germans, who increased their pay by 5% to 10%. And the result of that loss of Greek competitiveness is now all too apparent in Greece. Many thanks for this blog. It very much hits the nail on the head on many counts. A minor note, though: Mr. Romakkaniemi has complained on Facebook again that you omitted a central part of his criticism of your position in the Helsingin Sanomat interview. This is not an honest argument on his part, but then what could you expect? More specifically, he contends that you did not meet head on his criticism of the idea that gov’t employment programs are unworkable and seems to imply that you (or other MMTers for that matter) cannot meet this challenge. This is of course not the case. To quote Mr. Romakkaniemi directly, the omitted part reads “Ja valtio voisi vain työllistää kaikki työttömät niin työttömyyttä ei olisi.” and translates into a sarcastic remark along the lines of “And the gov’t could employ all the unemployed persons, just like that, so that there would be no unemployment”. Between the lines it says “dream on, lefties”. Block letters, about six feet high. Better yet, Mr. Romakkaniemi then goes “Tätähän on joissakin talousjärjestelmissä jo koitettu, joten toimenpiteen vaikuuksista on selkeää empiiristä näyttöä.” or “Direct state employment has been tried out in certain economic systems, and the empirical record is clear. If I am not terribly mistaken on the intent of his wordings, Mr Romakkaniemi directly likens MMT-style employment guarantees with the Soviet system as such. b) a central argument put forward in modern monetary theory (and Mitchell in particular) is that such an employment buffer stock is not only workable. It is also a more efficient and humane macroeconomic anchor of price stability than the current mass unemployment anchor is. Which is to say that the MMT folks have a practicable and equitable solution to unemployment *and* price stability. But perhaps I misunderstood. Mr. Romakkaniemi apparently feels qualified to bully and intimidate the Finnish audience as he pleases, so that it would not dare ask such questions related to existing, practical alternatives to austerity. In conclusion this is literally a class act from Mr Romakkaniemi, groupthink with Finnish characteristics. ULC do matter, but as you pointed out, we have to take the exchange rate into account. If nominal ULC in Brazil rise by 25% but is constant in Argentina, then Brazil doesn’t have to become less competitive relative to Argentina if the Brazilian real devaluates 20% relative to the Argentinian peso. Finland has of course relinquished its own currency. That would not matter so much in terms of competitiveness if all of its trade were with countries outside the Eurozone. Even then, however, it might matter if the euro became overvalued for some reason, that is, overvalued from the Finnish point of view. I agree with Ralph that internal devaluation could work if all wages, and all prices, fell at the same time and by the same percentage. In such a case, real wages would remain constant and there would be no drop in domestic demand. There still would be a transfer of income from borrowers to lenders because existing loans would become larger in real terms. International competitiveness matters because imports matter. If a country can export only fewer and fewer of its goods, then its capacity to import also falls. Reduced imports often mean a reduced standard of living. Of course, if a country can only maintain its international competitiveness by repeated real devaluations, then it will also undergo a fall in its standard of living because of worsening terms of trade. I have tremendous respect for Bill’s and MMT’s intellectual breadth. MMT is financially evolved over present neo-liberal DSGE austerity nonsensical nonsense. There can be no denying that. However, it is still monetarily incomplete and also has the stench of orthodoxy hanging around its economic prescriptions. Employment, at least the 40 hour per week concept of employment is already passe…and is rapidly becoming more so by the minute. Combine direct monetary gifting to the individual at a rate equal to a near satisfactorily middle class lifestyle, a retail discount which creates actual price deflation and that is rebated back to participating retail merchants so that they can be whole on their margins and overheads and a 20 hr or maybe even a two day 16 hour work week….and you’d have an economy that stably hummed along on all 18-20 trillion cylinders and kept up with and even proactively lead technological innovation and AI’s disruptive economic and individual income effects so that we could all rapidly progress toward the ultimate goal of money becoming simply a ticket for the distribution of production. None of the above policies are unreal, impractical, not integrative of fully truthful aspects of current economic thinking….nor untransformative. They ARE transformative, and at the same time are cognizant of the necessity of incorporating rational and ethical regulation of economies as well. The new, OUR new monetary and economic motto must be: Transformation first! Rational and ethical regulation….right along with it! That is the fully integrative, ethic of completeness, full Wisdom perspective. Mere economics is dead. Long live Wisdomics! Why do imports matter? Only in a world of monoculture economies – which will then turn out to be brittle. Of course large companies want monoculture economies because then the country is brittle and cannot implement its own policies. Economies need to have high levels of internal cohesion within the political zone and low levels of coupling with other political areas. Then they will be resilient and can pursue policies for their own people that may be quite different from other political areas. They’re only unworkable if you refuse to believe that they are. Not only that, but a government employment program is absolutely necessary unless you are prepared to sacrifice about 5% of your working population to the ills of poverty. The private sector is unable to solve the problem either effectively or efficiently. If you have a productive economy, you do not need all the labour in it. Yet people always need something to do with their day that others consider a useful use of time. If the currency-issuer used Overt Monetary Financing to “gift” a middle class income to every person – essentially a Basic (or more than basic) Income Guarantee – where is your price anchor? The elegance of the Job Guarantee is that it provides a price anchor for the entire economy, in addition to serving people’s wellbeing, and in addition to maintaining a work-ready pool of people who can step into higher paid jobs in the private sector when the economy improves. Precisely. This is actually a description of the concept of subsidiarity which is the only kind of globalization that can be of benefit to the individual of any nation (internal national cohesion) and not become an enforced tyrannical one size fits all ideology like either socialism or finance capitalism. This is simply an arbitrary statement. The correct statement would be that they are workable and better than austerity, but they are a palliative and incomplete policy most basically because the productive process/economic system itself is inherently incapable of creating an equilibrium of total prices and total individual incomes with which to moment to moment liquidate those prices…by injecting money into it/an enterprise first…and hence what the economy requires are monetary policies which go directly to the individual first and which also do not incur a cost to the individual or to the system. In other words the actual solution entails the distribution of an ongoing gift of individual income, a universal dividend, and then (because as Steve Keen/Hyman Minsky correctly observe) price wise “the fundamental tendency of capitalism is upward” …so you also need to have a policy which deals with that price inflationary fact, and preferably proactively reverses that upward flow and effects actual price deflation, in other words a retail discount to the individual which is rebated back to participating merchants. The consequent increase in purchasing power from such dividend and discount policies would be to largely do away with the necessity for consumer finance in order to have a satisfactorily middle class lifestyle. As finance is a 5000 year old problematic business model…I’d say such “financial smalling up” policies are way over due. The price anchor is the retail discount mechanism I described above. In fact it is a price deflater which still fits seamlessly within profit making systems because it is rebated back to merchants. As for “How does work get done?” it gets done the same way it gets done now….only better…by robotization and AI. If there is more demand is there any doubt that production will be willing and able to absorb it? Also, if free sway is given to technological innovation and AI is there any doubt that more production will be available per unit of resources? The fact is technology and AI are trying to free us, but rigid economic orthodoxy like the insistence that “only employment can be utilized as a policy to solve the problem” foolishly inhibits, but will not be able to resist that freedom. The job of the future is a positive and constructive purpose/purposes. What government should then focus on (and as it should now) is acculturating and encouraging the plethora of positive and constructive purposes other than work for pay. From APEEP we have also produced a document http://chartalismo.blogspot.com.es/2015/10/y-si-salimos-del-euro-aspectos.html in which we address some operational issues. for universal social credit than centrist corruptable retail specific handouts. their wages and greatly increase their costs is not a price anchor it is a price accelerator. our deeply dysfunctional housing market.This needs a broad government response. of houses can all help to tackle this inflationary problem. I must admit being deeply sceptical,all automatic price anchor schemes raise my BS detector. than poverty and worthlessness but it is not a career ambition. Thank you for a thoroughly enlightening lesson about more than ULC obsession in Finland. If you have many firms paying half of what is considered a real living wage and without security then you have a huge problem you need to tackle, unless you don’t care about those exploited through those lousy conditions. If those firms can’t survive when paying a real living wage with security to match a JG (a JG which will increase effective demand firm’s live upon), then they’re business model is not good enough and the work they provide do not fit any career ambition either. To prevent the inevitable crises that capitalism creates there must be a policy to tackle the investment mania of the private sector. The private sector will create crises by either overinvestment in productive capacity or overinvestment in assets. The former will create an overproduction crisis and the latter will create an underconsumption crisis. There are therefore some central issues that need to be addressed. * The profit motive is a positive feedback signal that accelerates growth but also creates instability. When this is amplified by positive feedback effects within the financial sector there is potential for worldwide political destabilisation which is very dangerous given the current state of military technology. * Private sector productive investment usually has a bias towards productivity over products. This is because most innovation cannot be legally owned, especially blue sky research and development. Therefore the private sector often prioritises ownership by possession over ownership by law. Therefore a key role of government in directing resources is to provide a way of directing resources that compensates for the inadequacies of the profit motive. A wise Solomon figure is not a sensible alternative to the profit motive, therefore “government direction of real resources” is not wrong but it’s a phrase that doesn’t explain how governments should decentralise operational decision making. The resources that a government makes available to a hospital, school, etc. should be controlled by the institution. The allocative powers of government should be as decentralised as possible. As described in Steve’s original suggestion, I would say basic income is a policy which creates positive feedback, which suggests in the context of an overproduction crisis it would be a price accelerator. This is because Steve suggested a basic income which is relative to prices. However, in a benign context it’s a growth accelerator. All positive feedback signals within a capitalist system will accelerate growth but also create instability. My own view is that basic income can work within a policy mix but could also be dangerous within the wrong policy mix. If people receive a basic income and then decide to give it all to capitalists then this will just amplify the existing instability of capitalism. If it’s provided within a mix of other policies that allow people to spend their basic income supporting local non capitalist projects then it could be a successful policy. I don’t believe that it should be a central policy. Control circuits can have many negative and positive feedback signals that offset each other. The issue that needs to be at the front of people’s minds is that the instability of capitalism is not just an inherent bad. It also creates political instability and conflict which is incredibly risky in societies with advanced military technology. That is an ideological assumption that is contradicted by facts. The US military, the Peace Corps, AmeriCorps, etc, have worked very well, as did the WPA and CCC during the Great Depression. There’s a lot to argue for a couple of years compulsory service for both men and women, either full time on active duty or else part-time over a longer period, no exceptions for the privileged. Places should be made suitable for the handicapped, just as in public education. In fact, it should be considered as an important part of public education as well as service as a citizen. I disagree. Number one retail sale to an individual as I have mentioned before is absolutely the terminal end to price for any unit of service or product making it precisely the place to implement and direct policy. Number two profiteering within the productive process by industries leading up to and including retail sale could be monitored and graciously but definitively dealt with if it was serial and just flimsy accounting hiding profiteering. And again, even if some costs leading up to and including retail sale do go up the discount mechanism looking at and using the correct metric of the ratio of total costs and total individual incomes is there to reduce it. And don’t forget the discounts are fully rebated back to participating merchants so they are not harmed and can make more profit because businesses always make more profit when demand is readily and steadily available. Finally, the discount mechanism is a true macro-economic tool and is correctly placed at the terminal end of the productive process at retail sale…thus it can actually greatly reduce retail prices to consumers/everyone without harm to any traditionally productive enterprise. I mean like by 30, 40 maybe 50%. Why not? It’s rebated back to merchants after all, and discounting by these higher rates will simply better free the individual economically and also greatly reduce both the individual and businesses from the truly problematic part of the economy, namely Finance. Then, implement my trinitarian model for Finance previously posted…and the system flows gracefully and prosperously for everyone…even for the smalled up model of Finance. The motto again needs to be Transformation first!…rational and ethical regulation right along with it! Government needs to be sovereign but gracious, patient but adult and real, philosophically and ethically hierarchical and yet structurally obeying and reflecting the concept of subsidiarity. Understanding the above is made easier when one “breaks through the sound barrier” about the most basic disequilibrating factor in economics which is that, as a flow, there is a continual scarcity of individual incomes created by commerce/the economy itself in ratio to total costs that need to be liquidated. In other words A will not pay for A + B. One has to actually decide to look at the dynamic flow of cost accounting statistics where depreciation costs and a host of other additional and extraneous costs will reveal that truth, and then do the calculus on the relevant data. That is the non-blinkered, non-orthodox and scientific way that reality is best deciphered. But one actually has to be willing to look at the data. I’ve tried to get the Austrian/Libertarian blogger Mish Shedlock and his forum members to actually do that for like 8-9 years. Nope. Orthodoxy gets in the way. Surely liberal progressive theorists can’t be that stubborn and orthodox. Job Guarantee (as historical proof provides) does not act like a soviet style system which breaks the capitalist class extraction of surplus profit from labour (the ‘social’+ism component where workers sieze means of production). Job guarantee reinforces the workers skills and sustains purchasing power FOR the capitalist class to see continued extraction of profit. It ENFORCES/SETS a lower bounds of ‘bid for labour’ at the price of the Job guarantee (~minimum wage) as opposed to slavery or neoliberalism which circumvents the minimum wage. Could also argue that other components of MMT could set an upper bounds for price of labour too but Mr Romakkaniemi wont be interested in mentioning that. In this way Mr Romakkaniemi is entirely wrong but its great ‘cheap’ way to scare the public (by likeness to stalinism or what not). Steve how will subsidies to retail tackle the greatest inflationary pressure in the UK ? That is house price and rent inflation? The fact that many employers are not paying a living wage is a problem is some understatement! Humanity has not cracked the problem of poverty yet. Let’s hope the next few hundred thousand years we come up with an answer. What are the retail products of real estate, home building and rental businesses? Depending on retail subsidies and income transfers is another iteration of the regulatory state policies of the 20th Century. With many hands grasping the economic steering wheel such policies presume to tell us how often and to what degree the wheel may be turned. A controlled economy with a dedicated driver rather than a regulated one is needed. Ending unemployment via direct means is therefore a superior choice though it is unlikely to be sufficient as an inflationary buffer (the current policy of maintaining mass unemployment is certainly no better in doing so) because it can only act against spending-induced inflation (what Lerner called inflation I). We should take into account the man thought it necessary to write a book on how other sources of inflation can cause functional finance to fail. Any truly “progressive” policies will be uniquely vulnerable to such a failure because they will be given no benefit of doubt: blame would immediately focus on the associated spending whether it was the source or not. Under sound finance (every bit as prone to inflationary failure) spending and excessive wages will also be blamed with no responsibility assigned to the policies themselves. Progressive policy is thrown away while conservative policy is doubled down upon. The retail discount mechanism and percentage I am envisioning is a macro-economically derived one that would apply generally and to every product and service based on the formula of total cost of individual consumption over total cost of overall production for a given time, say monthly (although with our current computing power that could be a shorter period of time). It is placed at retail sale to an individual for good reason. As I have said before retail sale to the individual is where the total costs for any item are terminally summed. Thus placing it there would be completely unobtrusive because every merchant including retailers will have been able to discover their best price BEFORE the discount was applied. Then, as the discounts given to the consumer by the retailers are completely rebated back to the participating merchants there is absolutely no harm done to any business entity…and of course the individual is graciously granted a price that actually ends up greatly increasing their individual purchasing power. As for income transfers….there is no transfer. The universal dividend and retail discount policies are directly Distributive in nature, not RE-distributive. They simply use the digital plus and minus nature of the monetary system to “zero in on” the two most problematic and chronic problems of technologically advanced economies, scarcity of individual income and inflation, and solve them without incurring an additional cost to either the individual or the system. Wisdom is the integrative process no matter whether it is applied personally or systemically. The above two mechanisms integrate seamlessly with profit making systems and the digital money system. They express the necessary new economic and monetary paradigm of direct monetary grace/monetary gifting that will enable us to embrace robotics and AI rather than fear/fight them. It will also enable us to finally, after 5000 years of instability and servitude, terminatedly handle and break up the monopolistic paradigm of Loan ONLY long standingly enforced and puzzlingly enjoyed by the business model of Finance. MMT is reflective of this paradigm. I’m just extending its systemic scope and its reach all the way to the individual. The more one “gets their head around” the direct distributive grace/gifting paradigm the more its universal solvent nature becomes apparent. Wisdom applied is not BS, but rather the higher relevance and pragmatism. New paradigms are always generally considered absurd…right up to the time the old paradigm is generally recognized as completely unworkable….and absurd itself, for instance the structural absurdity of austerity. Again, applying a discount cannot be an effective price anchor because it does not address inflationary effects that do not result from spending. Nor can income transfers (all income shifts are transfers) act against administered inflation or alter the capital/labor income ratio over the medium-long term. These are in effect band-aid solutions proscribing new rules for turning the wheel in hope we get the right course set. Regulation rather than control. Steve you are really not selling retail discounts for me.Still sounds like corruption . by debt jubilee proponents.It also does not deal with asset price inflation. the negative tax bracket but being universal it should cut right through the shirkers and strivers debate. in a short period of time .The mega rich are not about to go quietly . Sure it and can and sure it does if it is administered at retail sale to an individual…because again, that is where ALL costs for any item are terminally summed….due to both production costs and any other costs whether they are circumstantial, due to asset inflation from bubble creation or even arbitrary decision by the enterprise. Not if the income is a free and additional gift as the dividend actually is. They are not really handouts they are hand backs at and only for actual retail sales that are graciously given to the consumer….and then just as graciously given back to the retailers. As for their indefensibility, Steve Keen’s concept of a modern debt jubilee correctly would give those who did not have debt (actually a very small number of individuals nowadays) an equivalent cash payment so there is no moral hazard there, plus considering present world circumstances and the fact that long economic downturns very strongly rhyme with war….the obviously ethical thing to do is eliminate the debt overhang and go from DefCon 4 to DefCon1. The policies I am referring to are aligned with and actually effect freedom for the individual and free flowingness to the system. Effecting freedom is effecting freedom. A = A. I’m sorry, but belief that centralized government and policy is necessarily tyrannical is too general to be completely rational. Bill, do you mean COMPETITION ? Further, there is a fallacy of composition / COMPETITION operating at two levels. First, at the international level, if all nations are engaging in austerity and internal devaluation (which is the Eurozone mantra) then they just chase each other down the drain without any relative gains.